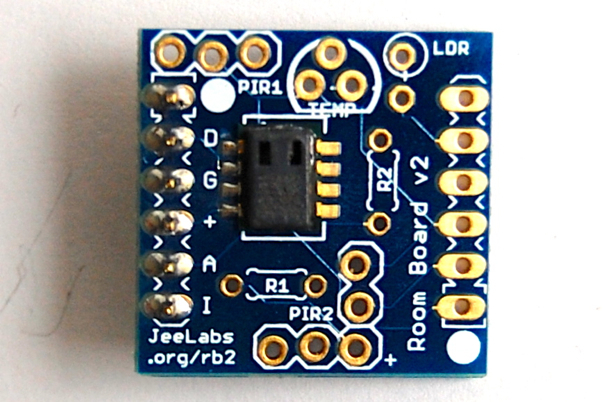 This sensor will be included in all Room Board kits from now on. As you can see, this reports both temperature and humidity with 0.1 resolution. The output gets converted to a float for display purposes, but apart from that no floating point code is needed to use this sensor. This means that the HYT131 sensor is also much better suited for use with the memory-limited JeeNode Micro. It’ll take a little extra work to integrate this into the roomNode sketch, but as far as I’m concerned that’ll have to wait until after the summer break. Which – as far as this weblog goes – will start tomorrow. Update – I’ve uploaded the datasheet here. Now what is this outside you speak of, and where can we download it? Neither RS or Farnell know about it – is there a data sheet around? I’ve added a note – more substantial changes planned for later this summer. Neat device – unfortunately the spec disallows sustained use in the steamy tropics here where the humidity sits often at 85% plus ! The automated weather stations here usually fall back to a modernised version of the wet/dry bulb thermometer method, complete with a requirement to top up with distilled water periodically. Humm… this board is very handy for a project. Hope it appears soon. I’ve currently done with a my own PCB mixing things,and now i’ve pirs to add to the project. As i can seen this has space for temp sensor/pirs/ldr and humidity on the board. Maybe after jcw summer vacations we can have some!! Is it just as power efficient as the SHT11? I could only find “Low power consumption” in the datasheet? Yep, good suggestion. In this case, since it was just a demo, I went for the easy way out.